The Hermanus Cycling is in a town described as the Riviera of the South. It is famous for its champagne air, long stretches of beach, mild climate, rich floral kingdom and the best shore-based whale -watching destination in the world. You will also explore some wine estates in the area. Wheels, whales, wine and wildflowers ! With its unparalleled scenic beauty, modern infrastructure, upmarket shops and endless adventure options, it’s little wonder that Hermanus has grown in size and popularity during the last decade. Hermanus has the status of being the best land-based whale watching destination in the world. Southern right whales visit Walker Bay from June through to December and can be viewed from aboard a boat, an airplane or the shore. Hermanus is home to the world’s only Whale Crier who blows his kelp horn when whales are spotted along the central sea route. Hermanus is a cosmopolitan town but has retained some of its historical fisherman’s village heritage. A number of craft markets sell a range of interesting wares and create a vibrant atmosphere. The old harbour with its restored fishing boats gives a glimpse of times past. Hermanus’s two lagoons and the ocean provide a water sport paradise for kayaking, canoeing, wind surfing, etc. Shark cage diving provides an adrenaline fix for adventure lovers. Hermanus has something for everyone. Hermanus may no longer be a village, but the character and atmosphere of this vibrant town offers a lifestyle few places can match. Beaches Long stretches of soft, white sand beaches, small rock protected coves and spectacular wave action. One of the most beautiful coastlines in South Africa. The cliff paths are unique. “Fynbos” plants and wildlife The Cape Floral Region is the smallest, but richest of the world’s 6 floral regions- no less than 9,000 species. It has been identified as one of the world’s 18 biodiversity hot spots. Interesting town A cosmopolitan town, but it has retained some of its historical fisherman’s village heritage. A variety of shops, markets, boutiques, art and artists, creating a vibrant atmosphere. 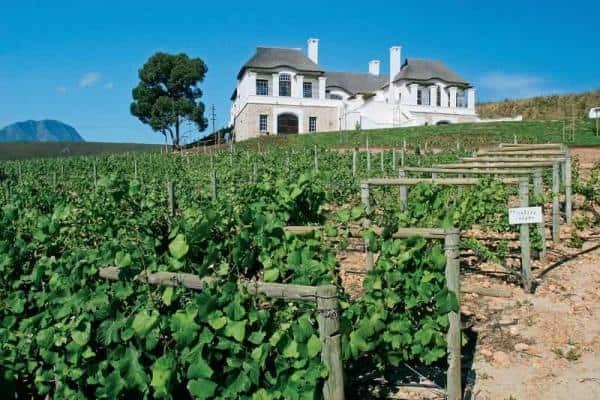 Hermanus Wine Route The route unites the passion and reputation of fifteen wineries, each growing small volumes of premium quality wine in carefully and sustainably managed vineyards. These wines draw wine lovers from all over the world. See details of some estates below. 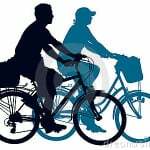 Other activities Other activities in the Hermanus area can be added to the cycling package. Hermanus is a haven for the outdoor enthusiast. There is golf, canoeing, shark diving, horse riding, walking, etc to enjoy. Arrive in Hermanus and book into your accommodation. You will meet our Route Manager for a cycling briefing. 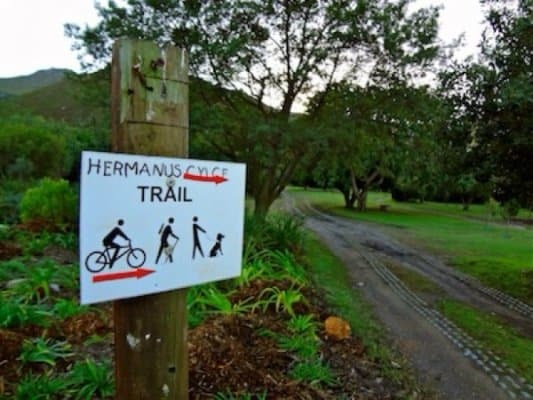 Hermanus Cycling is a “centre based” cycling holiday. It allows you to stay in a great location for the duration of your tour and enjoy daily cycling trips before returning back to your guesthouse. We offer the choice of two cycling bases, either the town centre or the Voëlklip beach area. 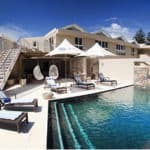 You will stay in one of Hermanus’s finest hotels or guesthouses and visit restaurants serving mouthwatering international cuisine. A panel of establishments has been selected to allow for non-availability. Any of the guesthouses can be a great base for your holiday. Click on the pictures to view the high standard of accommodation. Day 4 can be limited to the Hemel-en-Aarde Valley, if an easier day is preferred. Any time of the year, but the weather is more predictable during “High season”. Reserve early to obtain the best rooms. “Low season” is a good option for local guests who are either prepared to accept weather risks or to change their plans at short notice. During low season accommodation is normally more freely available. Weather in the Western Cape Coastal region is mild Mediteranean. 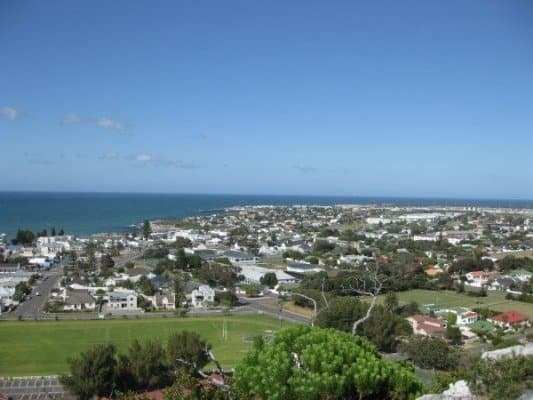 Hermanus enjoys a mild climate. Winter, although the rainy season, has nonetheless many sunny days and is generally mild, with high winds at times. Summer is dry and sunny, with high temperatures tempered by sea breezes. Early autumn (March) is idyllic, with balmy days and late afternoon sea mists – the so-called Hermanus “champagne air”. Hermanus is truly deserving of its reputation for happy holidaying. During the summer months the white sandy beaches are filled with holiday makers enjoying the sunny weather and excellent swimming in the sea. Hermanus is the ideal overwintering resort for visitors who wish to escape the cold Northern Hemisphere. Fly to Cape Town International airport and drive from Cape Town to Hermanus by car. If you are driving from Cape Town and have some time to spare it is worth turning off the N2 onto the R44 (Clarence Drive). Driving from Cape Town take the N2 towards Somerset West turn left onto the R44 to Strand and proceed until you reach Gordons Bay. Travel on the R44 along the coastal road where you will pass the Kogelberg Nature Reserve which is known for its beautiful natura, “Fynbos”. Carry on with the road past Rooi Els, Pringle Bay and Hangklip. You can visit Stony Point in Betty’s Bay which is the home of the African penguins. There are numerous paths leading past the nests which will give you photographic opportunities. After Stony Point the road leads you past Harold Porter Botanical garden. Carry on with the R44 through Kleinmond for about 11 km until you reach the T-junction. Turn right onto the R43 that leads to Hermanus. Drive on the N2 heading towards Cape Town, until you pass through Riviersonderend and about 8 km further you get a turn off left to Rietpoel / Stanford / Hermanus on the R326. Drive through wheat fields and sheep farms, until you reach an intersection. Drive straight across the intersection and continue driving until you reach Stanford. 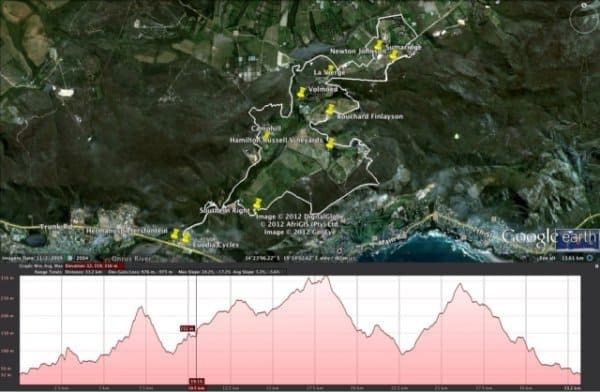 Before entering Stanford take the turn right to Hermanus which is 20 km away. Wearing a helmet while cycling is mandatory and bicycles need to be equipped with basic repair kit. These items can be provided with bicycles rented via us. Bring your own if you prefer so. If you decide to bring your own, a MTB is the best choice (not a road bike or hybrid). It is important to be comfortable when cycling so we suggest wearing thin layers of clothing. Fast drying and hard-wearing synthetic fabrics are ideal as a base layer as these allow your skin to breathe and wick the moisture away from your skin to the next layer, avoiding the chill which cotton T-shirts can cause. A thin fleece or sweatshirt is ideal as the next layer. You should also take a lightweight waterproof jacket (breathable and windproof material is best). Sport shoes are fine for cycling and for when you stop off to visit places on foot. For your daily needs, you are advised to have a day-bag, a plastic bag to line your day-pack (to protect the contents from rain), sunglasses, sun block, a water bottle, plastic picnic box (for transporting your lunches), first-aid kit, camera and extra plastic bag for litter. Plan for swimming in Summer. We recommend that you arrange appropriate holiday insurance covering you against illness, injury, and loss or damage to luggage. This insurance should also cover the possibility of your having to cancel your holiday for any reason. Our detailed route notes and description allow you to ride self-guided and at your own pace amid splendid scenery while we transport your luggage. As soon as we have finalized your booking and hotel schedule we will forward your Hotel guide per email. This will specify your hotel schedule and directions. (We use different hotels/guesthouses from time to time) The second component of your route description is your Route guide. This specially prepared guide includes route notes, maps and GPS references Going self-guided is simple and convenient with our Route and Hotel guide. It allows you to set out when you like, stop where you want and visit sites en route that are of interest to you. The Route guide will be given to you on the date of your arrival.